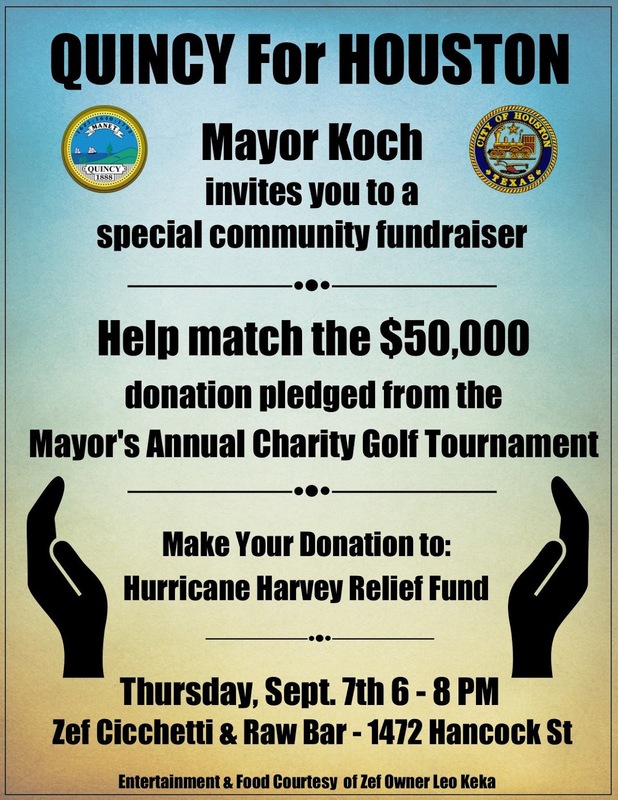 QUINCY - Mayor Thomas Koch today announced a special community fund-raiser to assist Hurricane Harvey victims from 6-8 p.m. on Thursday, September 7, at Zef Cicchetti restaurant in Quincy Center, and he launched the effort with a $50,000 contribution from the annual Mayor's Cup Charity Golf Tournament. All are welcome at "Quincy For Houston," which will support the relief fund created by Houston Mayor Sylvester Turner and administered by the Greater Houston Community Foundation, a registered 501(c)(3) public charity. Checks should be made payable to the Hurricane Harvey Relief Fund, and all collections will be sent in one package as a gesture from the people of Quincy. There will be entertainment and food courtesy of Zef owner Leo Keka, and event-goers are welcome to stay to watch the Patriots game later that night. "I've been incredibly heartened by the number of people in Quincy who've approached me asking to do something, anything to help. 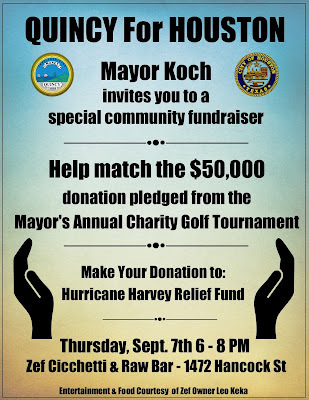 We just thought an informal event like this where we can come together and show our support as a community would be a nice way to harness that energy," said Mayor Koch. "These families suffering right now may be pretty far away, but they are very much our neighbors. They need our help now, and they are going to need it for some time to come." The City decided to collect monetary donations on the advice of several relief organizations, which say that financial resources are - and will be - the most pressing need for the agencies that charged with assisting in the monumental relief and recovery effort in Texas. Our neighbors in Texas need our help. Join us for a special community fundraiser next Thursday, Sept. 7 from 6 to 8 p.m. at Zef Cicchetti in Quincy Center. Checks can be made payable to Hurricane Harvey Relief Fund, and we'll be sending all donations in one package as a gesture from the people of Quincy.